I can thank Renner Springs for a blonde discovery. Turns out those iconic rural windmills are not just ornamental, they put them where the wind blows to pump water. Cue another flappity night of unsecured canvas, and crotchety camper inhabitants. 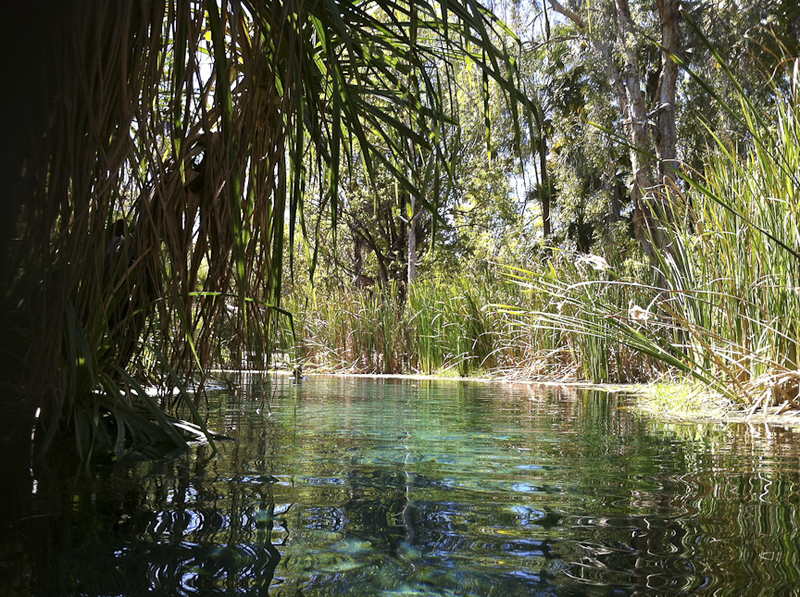 Natural hot springs can be found about 110kms south of Katherine, just off the Stuart Highway. Choosing Mataranka, we picked our way around the bunch of people that make a career of finding public hot pools, clinging to the entry and exit steps, and giggling nervously about not being able to swim. Taking our place in the pool next to all the other sardines, we pretended not to hear blush-worthy conversation, fought the urge to stare at others body parts, and scowl at those amongst us Most Likely to Pee. I lasted about 1 second longer than W, threatening to transform the tranquility into a wave pool by fidgeting, for a grand total of 5 minutes. Hopes still high, we decided the much lower profile Bitter Springs was worth a visit. The brief summary of Bitter Springs in our tour guide ill-prepared us for our visit. Stepping into a narrow creek fringed by palms, the warm, crystal clear, deep teal, water slowly flowed, carrying us along with it. Small turtles slept on the exposed tree roots. A water monitor lazed warily on the bank. It was like that Theme Park water ride where you float around in a current on tubes, but without the screaming, garish tones, and fibreglass. On the sterling recommendation of friends J and L, we booked one of the permit-only 4WD camp sites at Koolpin Gorge in Kakadu. 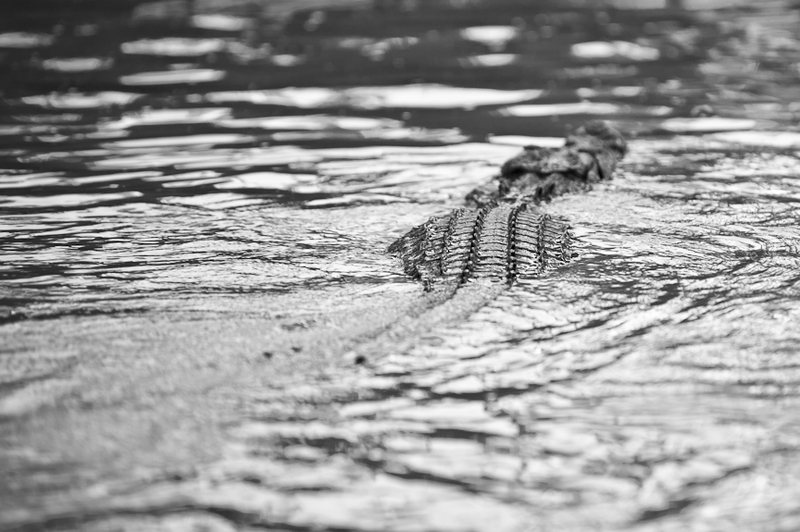 Picking up the key to the gate, the ranger warned against swimming in the two pools nearest the camp, as saltwater crocodiles were known to inhabit them. The pools that ascended from these, linked by waterfalls, were not known to have any saltwater crocodiles in the house, due to the difficult access. I took it that the likelihood of actually seeing one was slim, and although the Rangers are careful not to condone swimming outside the hotel pool, taking a dip in one of the countless waterholes was business as usual. We took one of the unmarked paths to the first croc-free pool, and boiling hot by the time we got there, popped into our own outdoor swimming arena. I’m a beach girl, and a confident swimmer, yet I’ve never developed the same love for fresh water; rivers, ponds or gorges. As I doggie paddled my way from one end to the other I observed that I wasn’t really enjoying it, and in fact, may have found my kryptonite. The black below me, silence around me (once W stopped thrashing), and my over-fertile imagination conjured up scenarios at odds with the sparkling surface fringed by perfect palms. In standard operating mode we spent a full six minutes out of the water before eyeing off the climb to the next pool (to the right of this picture). Recalling a great summer holiday 20 years ago at Anakiwa Outward Bound with my cousin and her instructor hubby R, I channelled R’s calm and encouraging tones as I grabbed for foot and hand-holds. I found myself flat against the rock face, with a single finger wedged in a crack above me, and both feet below me claiming ownership to two small ledges via my big toes. Stuck. My right leg independently started a sewing-machine-like action, and from somewhere within, sobbing ensued. W offered a knee to stand on and once foot was transferred added, “You have to move, I cant hold you there forever” and other useful things like “Focus. You’re being silly.” Once the shrieking had subsided, I recommended he never volunteers to talk someone down from a ledge. The next morning we decided to tackle the gnarly looking unmarked ridge to the upper pools. The view back to the camp and along the pools was stunning. To the left, the croc pools, and immediately underneath, the first pool we swam in. 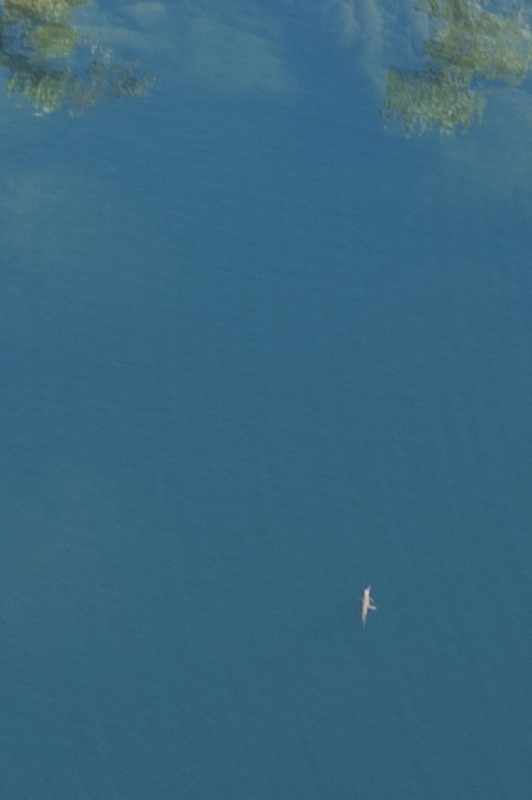 I looked a little closer. In the middle of the pool was a crocodile spread out like a starfish, sunning himself, and taking in the serenity. I cursed not bringing my long lens! The wide angle lens I had with me reduced the scene, and detail of the croc along with it, but I managed a Yeti quality snap all the same. By the time we reached the pool, W hissed in exasperated tones “what are you doing back there? Get over here! You won’t get a good shot from there”. A gold beady eye at waterline caught W’s, and slipped under. We spent the next half an hour watching Colin the Croc’s progress trip around the pool, bubbles breaking the surface where we went in the day before, along the edge, and everywhere we swam. Spurred by fears that a family would lose a child if we did not report the sighting, we used the emergency phone at the campsite. One hour later a helicopter circled overhead. A couple of hours later, a Ranger appeared and concluded it was probably a ‘Freshie’, the shy and non-threatening Fresh Water Crocodile. 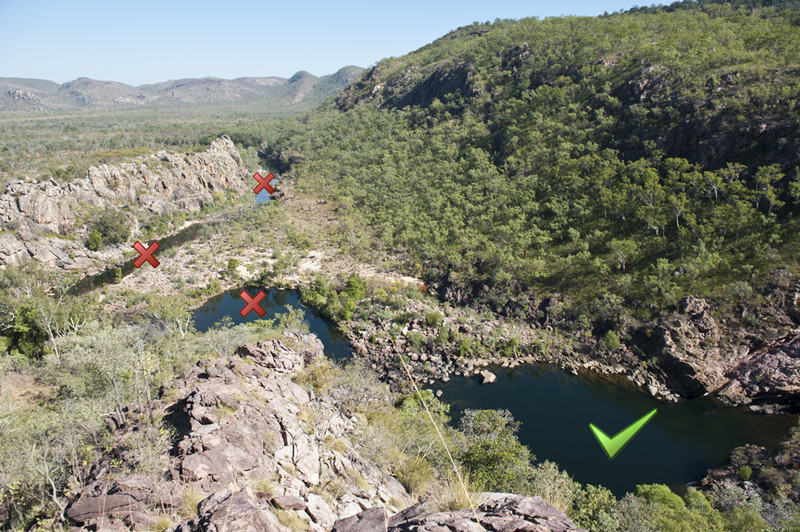 Given that they were present IN MOST POOLS in Kakadu, he felt this was the most likely conclusion. Wishing I could turn back the clock to when I thought they existed only if you could see them, from a boat, I learned the Freshies are in most of the pools, just waiting for you to leave so they can do their own thang. Later that day, I went for another swim, in the highest pool I could climb to, and talked myself through a panic attack. I’m not brave all the time. Did you get to Lawn Hill National Park (Gorge)…We try to get up there once a year (North Queensland is my old stomping ground!)?? Always remember that if there is to be a sacrifice, husbands first. Does Woz ever actually work?